Since 1946 The Chandlery Yacht Sales has been Santa Barbara’s premier yacht brokerage. Three generations of the Kieding family have been at the forefront of the Yachting industry. Ray Kieding was born in 1908 in Chicago. Ray was always drawn to sailing, even as a child. His first boat was acquired when he walked past a coal yard in Chicago and spied the stern corner of a boat buried under a pile of coal. He asked the owner of the coal yard about it and was told, “If you dig it out, it’s yours.” And so he did. Years later, Ray, along with his wife Kathryn and two young sons, chose Santa Barbara to call home. Sailing was a big draw. Ray soon joined Santa Barbara Yacht Club whose quarters at the time was a suite of rooms in the California Hotel at the foot of State Street. Son Bob remembers seeing the Thomas Lipton Trophy that was donated by dictator Benito Mussolini crammed into two small closets! 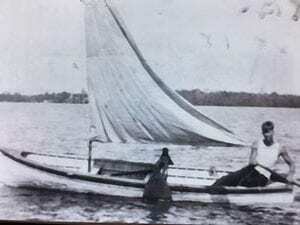 Ray Kieding, Kenny’s grandfather, at play on his sailboat. 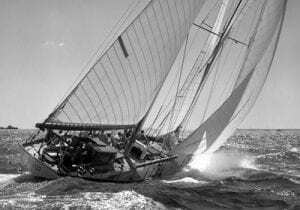 Ray was very involved in the sailing community and in 1948 started the 8-foot Sea Shell Fleet for his two sons, which continues to this day. Stop by “Sea Shell Beach” on any Sunday afternoon in Santa Barbara, and you’ll likely see dozens of kids racing their boats while their parents relax on the beach — just the way Ray envisioned. Bob Kieding is a lifelong sailor, having started at a young age crewing for his father, Ray. By the age of 9, Bob was racing 8-foot prams and then went on to race several one-design and offshore yachts, both in the United States as well as several other countries.  Founder of the Santa Barbara Maritime Museum. For many years Bob also wrote a weekly column highlighting nautical history for the Santa Barbara Newspress. Bob still resides in Santa Barbara and enjoys tinkering in his garage, traveling with his wife Joanie, and visiting with his six grandchildren. Ken Kieding was raised in Santa Barbara and has been sailing since the age of 3. His first experience on the water was with his father, crewing on a Geary 19. Later he raced his 8’ Sea Shell dinghy and then made the leap to racing Lasers. Kenny has raced a multitude of one-design yachts and is currently racing his own J70. Ken has years of offshore racing experience, including racing Trans-Pac (from California to Hawaii) five times. He’s also skippered Team California in the Tour De France Yacht Race. He’s won the MORC West Coast Championships, the MORC North Americans, and the J24 Pacific Coast Championships. As a 3rd generation, Santa Barbara Yacht Club member Ken has sponsored many, many friends and clients for membership. Kenny has also coached many private clients and enjoys helping boat owners get the most enjoyment out of their sail and powerboats. You can now find him coaching his youngest daughter on Sunday afternoons as she races her “Sea Shell” sabot in the Santa Barbara Harbor with friends.